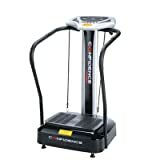 This compact Vibrapower vibration machine is ideal for people who want to get fit but have a hectic and busy lifestyle (VIEW PRICE HERE!). 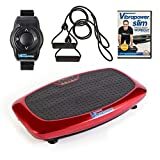 The Vibrapower features a compact design that is easy to move and store, various speed levels and workout programs, a helpful fitness DVD and loads more. Read on for the full details. The Vibrapower machine is a light, small and compact vibrating plate machine that can be easily moved from room to room or stored when not in use. This vibration plate machine is a little different to some of the others on the market because the arms are totally detachable, meaning that this machine consists of the vibration machine alone and attachable extras. This means that the Vibrapower is a lot easier to move and store when you’re not using it because it is lighter and takes up far less space than most gym equipment. Most exercise machines tend to be quite bulky and space-consuming, so the fact that this machine can be easily stored when you’re not using it may be a really important factor if space is an issue for you. The Vibrapower vibrating plates machine comes with two optional resistant bands that you can use to increase upper body and arm strength without having to invest in expensive and bulky weights. A lot of exercises tend to focus on the lower body, but improving your arm strength is really important for your overall fitness level and it really comes it handy for opening jars! The Vibrapower comes with 20 speed settings, so you can start off at a lower speed and gradually build up the pace as you become more comfortable. It’s really important to invest in a machine that has multiple speed settings because you need to keep challenging your body in order to see results. If your body becomes comfortable with its routine and you stop increasing the speed or resistant then whilst the exercise may help you maintain your current fitness levels you won’t keep improving. It’s very important that you keep improving your fitness levels not only because fitness can help improve your quality of life, your immune system, your health and your mood but if you stop pushing yourself you’ll probably stop losing weight. 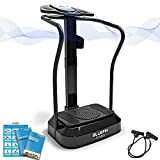 This vibrating machine also comes with three in-built workout programs that have been designed to focus on specific goals such as weight loss. You can also manually control the machine to set your own goals. This machine uses oscillation technology to help you improve your fitness and lose excess fat. The oscillation process basically mimics a see-saw and moves your body from side to side, which is not only great for weight loss but is also a good way of improving your balance. The Vibrapower vibrating machine is available in multiple colours including yellow and red, so you can pick a machine that will match your home and go with your furniture. When you buy this product you will receive resistant bands, a remove control, a power cord and an instruction manual. This vibrating machine also comes with a free fitness DVD which features a personal trainer who will take you through a variety of routines. 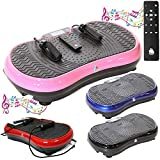 Some of the exercises will be suitable for beginners whereas others are tailored for intermediate and even expert vibrating machine users, so no matter what your fitness level is you can still get a lot out of this DVD. This is a compact and efficient vibration machine that has enough settings to keep you busy for a long time. The fitness DVD and the extra work-out programs will help keep you on track (which is really important if you are working out alone) and you’ll get all the benefits of a vibration machine for a very affordable price! Do you want to get fit, but don’t think you have the time? Many people are wrongly under the assumption that the only way to improve your fitness and get active is to spend 4-5 days a week at the gym, go for a run early every morning or join several fitness classes. These approaches do work for a lot of people, but some of you may not have the time or may not feel comfortable going jogging or exercising in front of strangers. This does not mean that you can’t get fit and today there are loads of exercise machines that you can buy and use from the comfort of your own home. These machines are a great alternative to the gym because not only do you save time on travel and save money on annual fees, but you can use your fitness machine whenever you want. You could use it for ten minutes in the morning before work or in the evening whilst watching TV, all from the comfort of your own home! 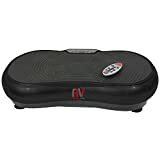 Vibration plates are an excellent way to get fit and lose weight if the idea of running on a treadmill or lifting heavy weights doesn’t appeal to you. Vibration plates work by making your muscles contract and relax as the machine vibrates because the vibrations make it harder for your body to keep its balance. You won’t have to do very much yourself (simple stand, sit or adopt another position on the vibration plates) but you will still get a very good workout that can give you great results over time. 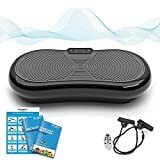 Vibration plates are low impact and so they are great for people who are new to fitness or older people who may need a gentler form of exercise. There are also loads of different positions you can use to target different parts of your body so you can work on the areas you care about the most (I.e. abs, arms, legs etc.) and most vibration plates have adjustable speed ranges so you can improve over time. Using vibration plates won’t only help you lose weight and gain muscle, but they also come with a whole range of other benefits. The vibrations can help with your blood circulation, they can improve your bone density and they can help relieve stress and improve sleep. All in all vibration plates hold a lot of benefits and it’s no wonder that they keep growing in popularity.